Will You Strike It Rich? A review of CBT Nuggets' video-based MCSE training. When gold was discovered in California in 1848, people flocked to the West Coast in search of riches—some succeeded, many failed. The dawn of the 21st century saw the explosive growth of the Internet, and many pundits predicted a modern-day gold rush. The new economy became just that, along with its eventual complement of winners and losers. Although computer jobs have become scarcer in "dem hills," many undaunted IT professionals continue searching and panning for job-security gold. For those '49ers still out there, keep diggin', your pot of gold may be just around the bend. In your search, you'll need the best shovels and equipment that you can find. This column has always provided an unbiased look at tools and products to help you pursue your certification endeavors. I'm sad to report that this month's review will be the last Drill Down that addresses exam-preparation materials. Starting in November, I'll be taking the same in-depth look at hardware for the systems administrator. I say so long, for now, by reviewing the CBT Nuggets series of exam-prep videos. Come along, partner, as I drill down for nuggets—CBT Nuggets, that is. The Windows 2000 MCSE Exam Pack comes in a binder with seven CDs, one for each of the Windows 2000 core exams (Win2K Professional, Win2K Server, Win2K Network Infrastructure and Win2K Active Directory, as well as one for each of the Designing Exams: Designing AD, Designing Security and Designing Network Infrastructure. You pop in a CD and up comes a Flash intro screen where you can then choose the topic you want to review. Unlike the studio-quality, computer-based training product I reviewed last month from Transcender Corp., which also incorporated computer animation, CBT Nuggets is a more rustic rendition. It's more akin to live classroom training in which the instructor walks you through concepts using hands-on computer demonstrations and drawing on an electronic whiteboard. The hand drawings aren't pretty, but they're effective in illustrating the concepts presented, although they could have been just as easily created using standard Visio-type graphics, which would be both more readable and pleasant to the eye. I like the use of the whiteboard for the spontaneous discussion it promotes, but I think it was a little overused in this series—especially for screens that illustrate bulleted topics, which are better suited for Power Point slides. The videos consist of AVI files created with TechSmith's Camtasia product. You need to install the TechSmith Camtasia Codec, which is included on the CD, to play back the video segments. You also need to configure your computer's display settings to at least 1024x768 screen resolution otherwise the videos are blurry and difficult to view. Just like in a live classroom, you can expect a non-scripted spontaneous style of instruction. The instructor's voice was pleasant and easy to follow; but with such myriad technical concepts to explain in a relatively short period of time, the presentation was, at times, a little hurried. Some Win2K novices may find it a little difficult to keep up. Fortunately, the Windows Media player's VCR-style interface allows you to pause and quickly rewind segments so you can follow along with the demonstrations at your own pace on your computer. Overall, the instructor demonstrated depth of knowledge and very good presentation skills. The video series covers a broad range of Win2K technical concepts and provides not only a good background for understanding the major services and technologies that comprise the Win2K OS family, but also provides real-world hints and suggestions. However, the big question on your mind is probably, "How well is it going to prepare me for the real certification exams?" From an exam point of view, the video series does cover the major technical topics that correspond to the Win2K exam objectives. Keep in mind, however, that while the videos may give you a quick snapshot of how a Win2K service or feature works, and the instructor goes on to explain some of these features in great detail, some of the details that may show up on the exams are glossed over or missed altogether. Normally, these "exam details" show up in practice questions or study guides bundled with a certification product; unfortunately, CBT Nuggets offers neither. I hope that, in the future, CBT Nuggets takes this product to the next level and combines it with its own practice exams or those of a third party—otherwise, you'll need to supplement the videos with additional products. Figure 1. 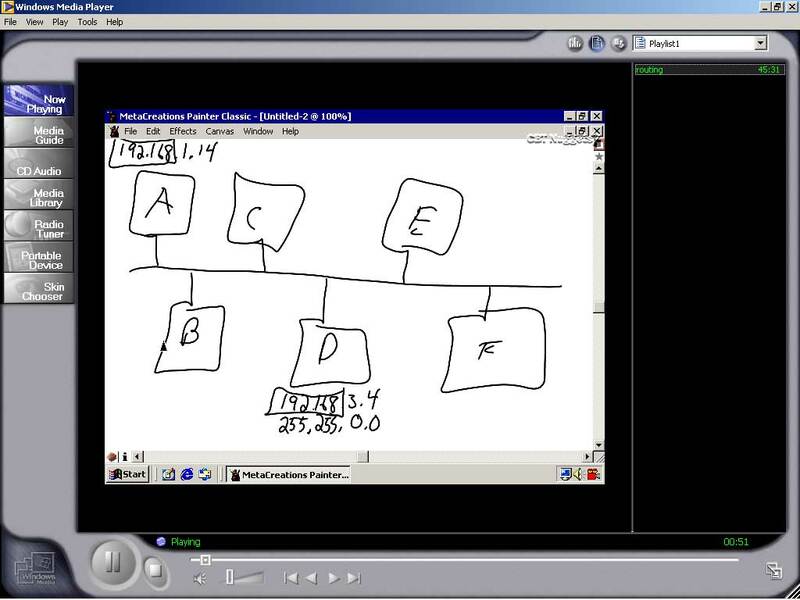 The instructor uses a virtual whiteboard to illustrate concepts. The technical accuracy of this video series is good, although I did notice some inaccuracies, for example, in the way IP host addressing, RRAS Policy logic and Domain Password Policy were explained. Overall, the technical content is sound with some minor technical editing required. The instructor was also not afraid to tackle some of the very cryptic technologies that make Win2K tick, like Active Directory Multi-Master Replication and Conflict Resolution, and explain these concepts in easy-to-understand laymen's terms. Anyone new to Win2K or even the experienced admin that needs a better understanding of Win2K technologies will find benefit in viewing this video series. If you're primarily interested in preparing for the Win2K exams, be aware that this series, although a great learning tool, isn't tailored completely to the Win2K exams. You'll need supplemental information to adequately prepare. I think this type of holistic training has great potential, especially because an operating system as complex as Win2K is intimidating to learn. The CBT Nuggets video series combines a good instructor and a great presentation style to create a whirlwind package that can help you cut through the technical fluff when you just want to know how a service or feature works and how can you can configure it quickly. Yes, there's gold in this product, just take your time to learn and enjoy your newfound wealth.